To wrap up a very lip-focussed week of posts, today we’re going from the softly-softly approach of Clinique Chubby Stick Baby Tints to the high-octane blast of pigmentation from Too Faced Melted Lipstick. Let’s cut right to the chase – these are AWESOME. 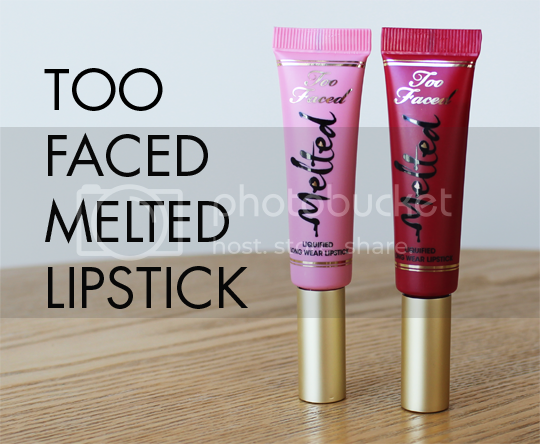 I instantly fell in love with Too Faced Melted Lipstick as soon as it was released in the US when I saw it featured in lots of American blogs and couldn’t wait for them to land over here in the UK. Well, they’re here now and I for one couldn’t be happier about it. 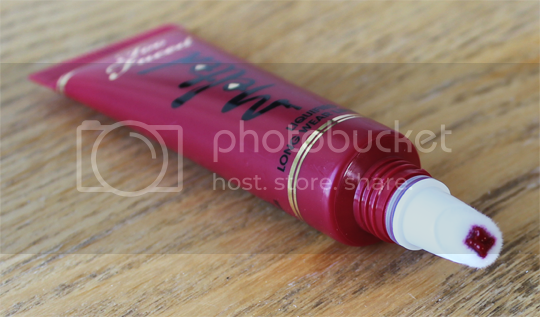 Jerrod Blandino – Co-founder and Creative Director of Too Faced – came up with the idea for the Melted Lipstick after a visit to their cosmetic lab. He was inspired by how lipstick looks in its melted form before being molded and set – it’s intense, rich and glossy. Using exclusive technology to keep a formula in a creamy liquid state, Melted Lipstick was born. The result is high impact, super rich, saturated colour that wears comfortably on the lips and is surprisingly easy to apply from the usually less than pleasant combination of squeezy tube and doefoot applicator. I wouldn’t say it’s hydrating, but its definitely not drying in the slightest. Despite that, it lasts a really long time before needing any sort of touch-up. You can even eat without disturbing it too much – within reason, of course. Something you can eat delicately with a knife and fork is fine but it’s not going to outlast a beastly burger or anything. Of the two shades I have, I’m finding it hard to choose a favourite. Despite looking quite a scary pink from the tube (in my opinion anyway), Melted Peony is actually quite soft and almost natural looking on me so I love that one for every day. Melted Ruby is obviously the more daring of the two shades, and is best highlighted by pairing with simple black liner and a flawless, contoured face. Too Faced Melted Lipstick* is available in store at Debenhams for £19, or find them online at Look Fantastic and Beauty Bay (where they’re on sale for £16.91 at the moment – go, go, go!). I have the peony one too and I love it. I fancy going for the pinky-lilac one next.